This cabinet card portrait features a well dressed woman and was produced by a female photographer in Montreal, Canada. 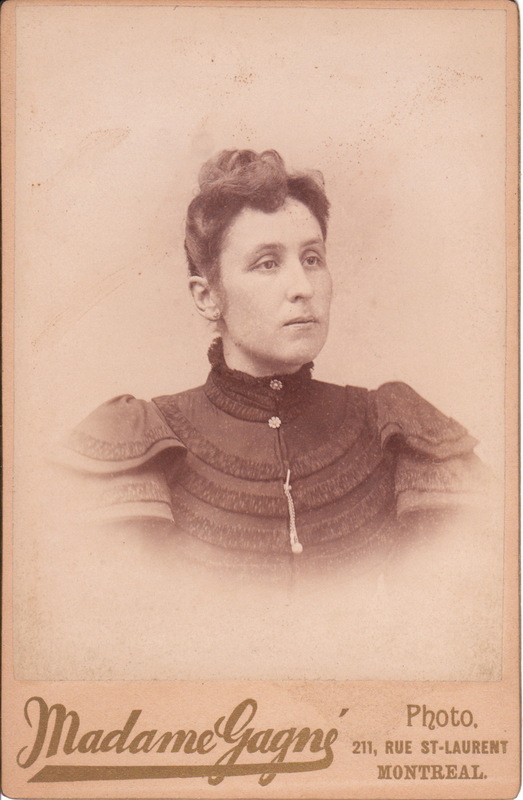 Madame Gagne ran a photography studio in Montreal in the 1880’s and early 1890″s. Gagne had studios at other locations in Montreal including 897 St. Catherine (circa 1885) and1823 St. Catherine (date unknown). She was located at the 211 St. Laurent address in 1895. She did a great deal of portrait work for the Chinese community. William Notman was the Montreal photographer associated with taking portraits of the elite. It is likely that Madame Gagne was married to fellow Montreal photographer, Edouard Gagne. The McCord Museum in Montreal has some of Madame Gagne’s work in their collection of historic local photographs.